The Christian author from Alabama goes through the Book of Revelation to challenge common-held beliefs about the Rapture. Challenge your common-held beliefs about the Rapture with this book and ensure your place in the actual event. Glenna Hartzog is so blessed to have read and studied the Book of Revelation for it has given her new insights about the Rapture. The Rapture, according to the Bible, is an “end times” event where faithful believers are taken up to heaven to meet Jesus Christ at His return. Most Evangelical Christians believe the event will take place before the seven-year tribulation period, which is a time of great death and destruction. Hartzog, however, does not adhere to the pre-tribulation view. In her explosive book titled “Watch and Pray: Be Ready” (Christian Faith Publishing, 2016), she espouses the idea of a Rapture that will take place after the tribulation period. The author goes through the Book of Revelation to lay the case for a post-tribulation rapture. The timing of the Rapture sparks a great debate among Christians; theologians provide their own arguments to support and refute various hypotheses on the tribulation period. Hartzog studied the Book of Revelation, in addition to the whole Scripture, and found the most biblical evidence in favor of her position. “A person who has gained an understanding of a biblical basis for a post-trib rapture benefits from the knowledge and will be more prepared than the one who will not recognize potential inaccuracies in strongly held positions,” emphasized the author. Glenna Hartzog’s “Watch and Pray: Be Ready” will soon be displayed in the upcoming 2018 Guadalajara International Book Fair on Nov. 24, 2018 to Dec. 02, 2018 at Guadalajara, Mexico. 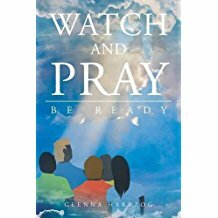 Copies are available through Amazon (https://www.amazon.com/Watch-Pray-Ready-Glenna-Hartzog/dp/1681972972), Barnes & Noble (https://www.barnesandnoble.com/w/watch-and-pray-glenna-hartzog/1123792224), and the author’s website (http://www.glennahartzogbooks.com). Glenna Hartzog was raised in south Florida. She committed her life to Christ at the age of thirteen and attended a denominational church faithfully. Through the years, she has been an avid lover of God’s Word. She has been a member of the full-gospel charismatic Christian Life Church in Eufaula, Alabama for over twenty years, and was a part of the worship ministry for ten years. Her knowledge of the scripture has come through years of anointed biblical teaching, and her own searching of the scriptures through prayerful study and meditation.